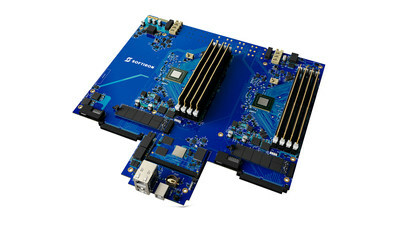 RUST, Germany, March 26, 2019 /PRNewswire/ -- Silicon Valley- and London-based enterprise storage startup, SoftIron, today unveiled its all-new HyperDrive® Performance model with embedded multi-processor technology, delivering unrivaled power and performance for the data centre. SoftIron's HyperDrive Performance is its top-end, high-performance range of custom-designed, dedicated Ceph appliances, purpose-built for software-defined storage (SDS). HyperDrive Performance Multi-Processor (HD32112) is the same high-performance storage platform, but with two storage nodes in a single 1U form factor, doubling the processing power and storage, giving you unparalleled results for extremely high load data centers. Ceph is the leading open-source software for SDS. As enterprise adoption of Ceph increases, so too does the demand for optimised solutions that can support hyperscale-grade data centres. SoftIron has championed Ceph since the company's inception with their HyperDrive platform; dedicated Ceph appliances and software custom built for SDS, and so have been at the forefront of this technology for years. Having pioneered the world's finest Ceph appliances, SoftIron is now meeting the complex demands of the modern-day enterprise with its elevated multi-processor technology. "We've noticed a significant shift in the needs and attitudes of our customers over the years as they have come to appreciate the value of a custom designed appliance for their data center," says Tim Massey, CEO at SoftIron. "They've learned the hard lessons of generic hardware and have seen the outstanding results of HyperDrive. Now, they expect even more, and we're really happy to be able to deliver that in the form of our new Multi-Processor technology, starting in our high-end Performance range." Tim continues, "The elegance of the new HyperDrive Performance HD32112 is in the 1U form factor, allowing system admins to optimise their racks with double the storage density in the same amount of space. Coupled with the low power consumption of the appliance, less than 200 watts under full load, the positive impact on TCO over time is considerable, making this solution incredibly attractive for fast-growing data centres."